The Fokker DR.I triplane was built after the Sopwith Triplane. While not as fast as contemporary biplanes, the Dreidecker could easily outclimb any opponent. Small, lightweight and highly maneuverable, it offered good upward visibility and lacked the traditional bracing wires that could be shot away during combat. This combination of features made it an outstanding plane in a dogfight. When the DR.I first entered service, antagonists scoffed until pilots like Werner Voss showed what it could do in a fight. Flying a prototype, Voss shot down 10 British aircraft in 6 days of aerial combat during September 1917. Unfortunately, the DR.I was not without problems. By the end of October 1917, it was temporarily withdrawn from service when several pilots, including Heinrich Gontermann, were killed as a result of wing failures. 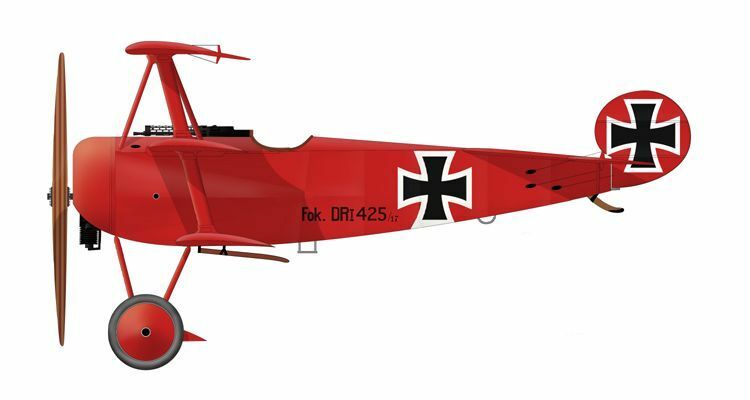 Despite structural improvements, the Fokker triplane’s reputation among German airmen never recovered.